Living in an apartment or unit can be difficult when installing kitchen appliances. It’s hard to find compact appliances that will fit perfectly into small spaces, unless you shop at MyDeal. Our range of small table top washers give you sparkling clean dishes after every cycle. With five cleaning programs, LED screen and a delay start function, with the ability to set a time cycle for later. Whilst apartment living can be tough, living in a household full of hunger adolescent children can be even worse without a fully integrated or built in dishwasher. Anyone from a large family can relate to never having enough clean dishes. With our double drawer appliances, you have an amazing amount of space for all your dirty dishes. With fourteen place settings, nine wash programmes and a fully adjustable racking system, this product is a must-have for all large family homes. 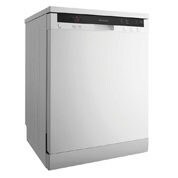 We also have freestanding stand alone designs or table top dishwashers to suit your home and budget. If you require more information about the amazing products above, please feel welcome to contact the MyDeal customer service team using the online enquiry and telephone services. From Garden Pots and Plants, to Dishwashers, MyDeal Australia will have something that’s right for you. Many products are eligible for free shipping Australia wide.